The former supreme allied commander of NATO, now a Burkle Center senior fellow, and UCLA law professors discuss provisions of the Military Commissions Act of 2006. Clark disputes need for "rough treatment" of detainees on practical, moral, and geo-strategic grounds. I certainly wouldn't have stayed in an armed forces or worked with a government that I thought was doing the same skulduggery that the Soviets and the rest of them were doing. That's what we were against. 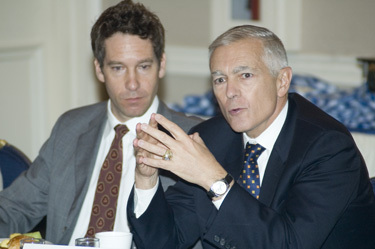 Addressing a UCLA audience for the first time as a senior fellow for the Burkle Center for International Relations, Gen. Wesley K. Clark (U.S. Army, ret.) expressed dismay at Congress' apparent embrace of indefinite detention and some forms of torture for terrorism suspects in the Military Commissions Act of 2006. Congress sent the bill to President Bush Sept. 29, the day after the Senate narrowly rejected an amendment that would have restored the right of captured individuals to have their detention reviewed by a judge. From counterterrorism and geo-strategic perspectives, Clark told invited guests at the Oct. 2, 2006, breakfast, America's turning away from the spirit of the Geneva Conventions is an example of "shooting ourselves in the gut." Clark is a former supreme allied commander of NATO and a 2004 Democratic presidential candidate. But Clark made his case most forcefully on moral grounds, highlighting an incompatibility between torture and both societal and military virtues. Excerpts from his comments and from those of UCLA law school lecturer Jack Beard, a former Pentagon lawyer, are given below. Professor Ron Rogowski, vice provost and dean of the UCLA International Institute, introduced Clark; and Professor of Law Kal Raustiala, who also teaches courses in the Institute's Global Studies interdepartmental program, provided a summary of the issues at stake in the approved legislation. The Oct. 2 breakfast, featuring responses to the Military Commissions Act and to suggestions that the Geneva Conventions are obsolete, was co-sponsored by the UCLA Burkle Center and the School of Law. According to press accounts, the legislation will, among other things, give President Bush wide latitude to decide what constitutes cruel, inhuman, or degrading treatment of detainees under the Geneva Conventions; to declare individuals, including U.S. citizens, "enemy combatants" under an expanded definition of that term; and to hold these people indefinitely so long as they are not charged and tried. Many observers read the legislation to rule out the most severe interrogation techniques, including one that simulates drowning. Also on Monday, the legislation drew its first U.S. legal challenge. In June, the U.S. Supreme Court in Hamdan v. Rumsfeld ruled that Common Article III of the Geneva Conventions governed the detention of Al Qaeda members. That ruling and resistance from within the Central Intelligence Agency to the use of legally questionable interrogation techniques reportedly led the Bush administration to seek the legislation. On the one hand, because of who we are and what we represent our soldiers have received a privileged status. On the other hand, all the cruelty in the world doesn't by itself break the spirit, break the will to resist, or end a fight; in fact, it strengthens and hardens resolve. If you look at Al Qaeda, although they're getting financial assistance from all over the world, they're not living in mansions. They're not really getting rich. Apparently Osama bin Laden, despite the fact that he has several wives, lives in caves. There's reason to believe they're a pretty tough, hardened organization. So you can't anticipate that they're going to break under pressure easily. The Yemenis have gone so far with Al Qaeda as actually having imams come in and doing "deprogramming," and actually arguing with terrorists…[with] some success. Then, of course, they apologize, they blurt out everything you want, and you can believe it. We thought we were in this uniform because we stood for something. We stood for what was right, what was fair, what was just: we didn't torture people. I certainly wouldn't have stayed in an armed forces or worked with a government that I thought was doing the same skulduggery that the Soviets and the rest of them were doing. That's what we were against. How can it be that we think we can condone that kind of stuff now? We've heard that argument. We heard it in Argentina with the desaparecidos. We've heard it all over Latin America. We've heard it in Europe. We read it in novels. We know enough, surely, not to trust it. We've seen it in history. We've seen great empires like Rome lose their moral authority totally when they departed from humane standards of treatment. We've got to have allies to help us win this war on terror. The only way those countries work with us is through our moral legitimacy. We shaped the post-Cold War environment. It was America that led the effort to create the Geneva Conventions. And now we're walking away from it? What happened to that shining beacon that was America when we can walk away from the very values that we've espoused? And then there's the future.... There will come a time when maybe America isn't the only superpower, and maybe not even the preeminent superpower. If you look at the economic map—assuming that we can get a grip on challenges like global warming—then it's reasonable to expect that India and China…will at some point have at least equal and maybe greater capacity than the United States. I'm not trying in any way to diminish what we consider exceptional about America, but it's just a reality that scale is one of the most important laws in economics. And they've got scale on us. And we've got to set rules of international behavior that work to our interest, that other nations will agree with and voluntarily adopt as their own. I like to think of these as the Golden Rules of international behavior: do unto others as you'd have them do unto you. As we sit here this morning, the radio airwaves in America are speaking a different story, and it's very disturbing as someone who has practiced in the area…to hear the Geneva Conventions described as an exclusive, wonderful way to provide nothing but basically resort treatment to terrorists. That through these conventions the terrorists receive every possible luxury they can have. "They're happy people now. Our hands are tied. We can't fight the war, and anyone who says otherwise is unpatriotic…." On the contrary, in the long run [adherence to international standards] is the only way you win.